You need a Linux, Solaris, or Windows system that can run the web policy agent (see the Web Policy Agent Release Notes section, Web Policy Agents Platform Requirements) with a minimum of 1 GB of free RAM memory, a few hundred MB of free disk space, a web browser and Internet connection to download software. See the documentation for your version of your system regarding how to allow traffic through the firewall on a specific port. A variety of firewalls are in use on Linux systems. Which one is in use depends on your specific distribution. 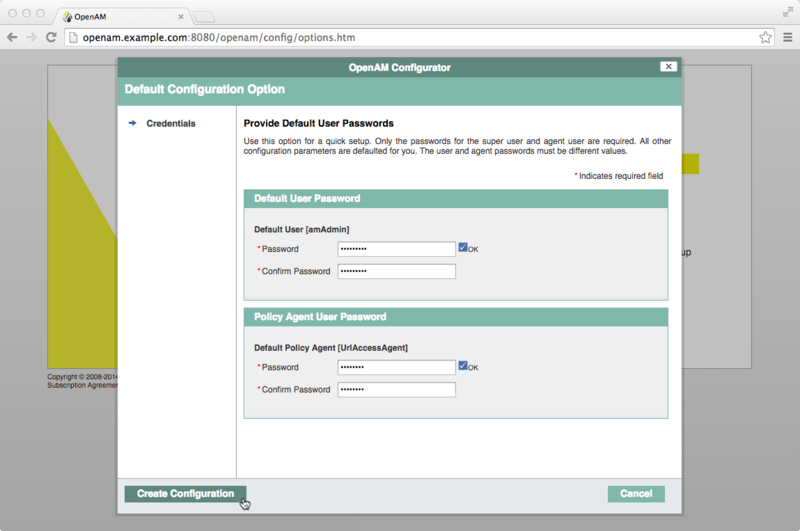 Set the Default User [amAdmin] password to password and the Default Policy Agent [UrlAccessAgent] password to secret12, and then click Create Configuration to configure OpenAM. 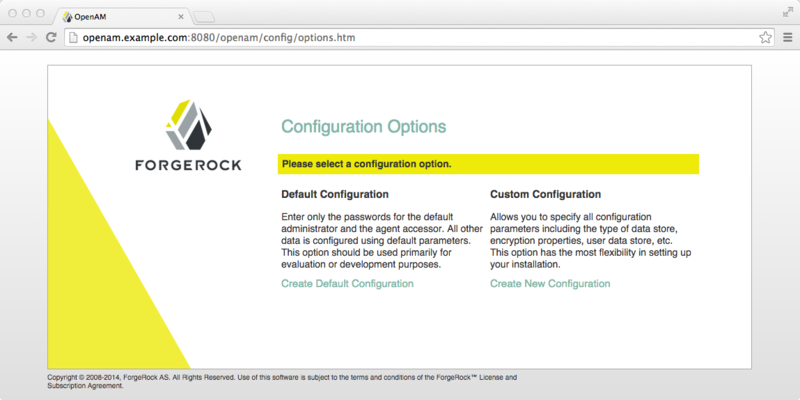 After login, OpenAM should direct you to the console at http://openam.example.com:8080/openam/task/Home and then to the Common Tasks tab. In the Console page for the top level realm, click the Policies tab, click iPlanetAMWebAgentService, and then click Add New Policy. For more information on the relationship between realms, applications, and policies, see Administration Guide chapter, About Authorization in OpenAM in the Administration Guide. 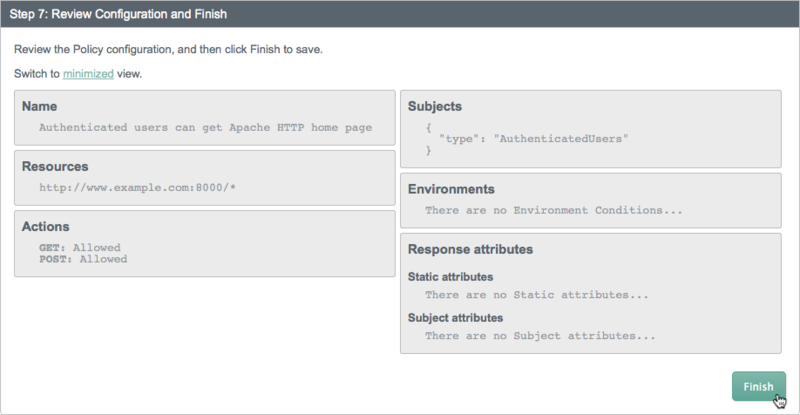 Give your new policy the name Authenticated users can get Apache HTTP home page, and then click Next. In the Specify Resources step, click *://*:*/* to move the pattern to the Create your resources section. Then, replace the asterisks so that the pattern reads: http://www.example.com:8000/*, and then click the Add icon. In the Select Actions step, select the GET and POST actions, ensure their value is set to Allow, and then click Next. In the Define Subject Conditions step, click Subject Condition, from the type drop-down choose Authenticated Usersand then drag the grey block into the green AND logical block above. In the Define Environment Conditions and Specify Response Attributes steps, click Next. If the configuration is not visible, click the maximized link. To make changes to the configuration, either click the relevant step, or click the item to jump to the relevant step and make amendments to the configuration. 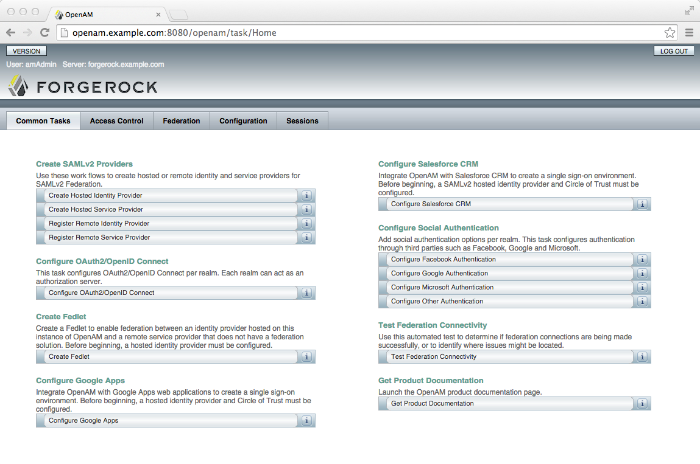 When the configuration is completed, click Finish. When you run the command, you will be prompted to read and accept the software license agreement for the agent installation. You can suppress the license agreement prompt by including the --acceptLicense option on the command line. The inclusion of the option indicates that you have read and accepted the terms stated in the license. To view the license agreement, open <server-root>/legal-notices/license.txt. User Self-Registration. OpenAM provides user self-registration as a feature of OpenAM's REST APIs. 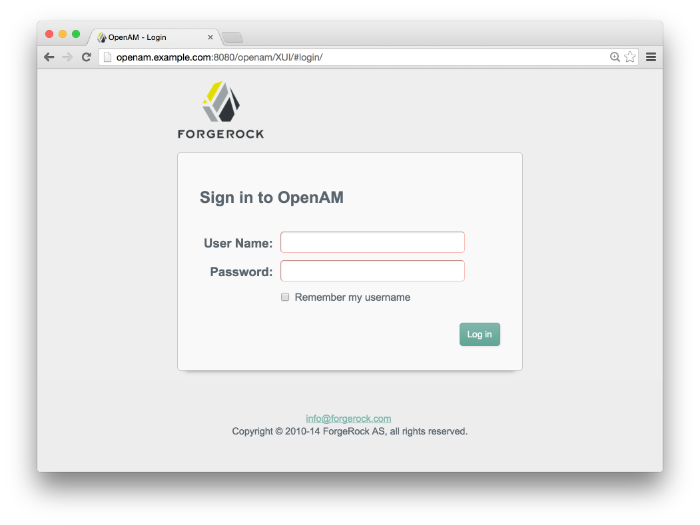 New users can safely sign up in OpenAM without your administrators or help desk having to get involved. For information on configuring self-registration, see the User Self-Registration in the Administration Guide section in the OpenAM Administration Guide. For details on building your own self-registration application using the REST API, see the User Self-Registration in the Developer's Guide section in the OpenAM Developer's Guide. Password Reset. OpenAM can help users reset their passwords on their own. OpenAM handles both the case where a user knows their password and wants to change it, and also the case where the user has forgotten their password and needs to reset it, possibly after answering security questions. For details on setting up password reset capabilities, see the Resetting Forgotten Passwords in the Administration Guide chapter in the OpenAM Administration Guide. For details on building your own application to handle password reset using the REST API, see the Resetting Forgotten Passwords in the Developer's Guide section in the OpenAM Developer's Guide. Dashboard Service. Users often have a number of applications assigned to them, especially if your organization has standardized on software as a service, for example for email, document sharing, support ticketing, customer relationship management, web conferencing, and so forth. It can be handy to present these applications on a user's web-based dashboard with the user's profile, and to assign applications to the user's dashboard automatically based on the user's profile. When your deployment serves as an identity provider for a SAML federation, OpenAM makes it easy to develop applications called Fedlets that your service providers can easily deploy to participate in the federation. For details, see the Developer's Guide chapter Using Fedlets in Java Web Applications in the Developer's Guide. OpenAM also supports standards-based access policies defined using the eXtensible Access Control Markup Language (XACML). XACML defines an XML Attribute-Based Access Control (ABAC) language with Role-Based Access Control (RBAC) features as well. For details on using XACML policies with OpenAM, see Section 3.3.5, "Importing and Exporting Policies" in the Administration Guide. 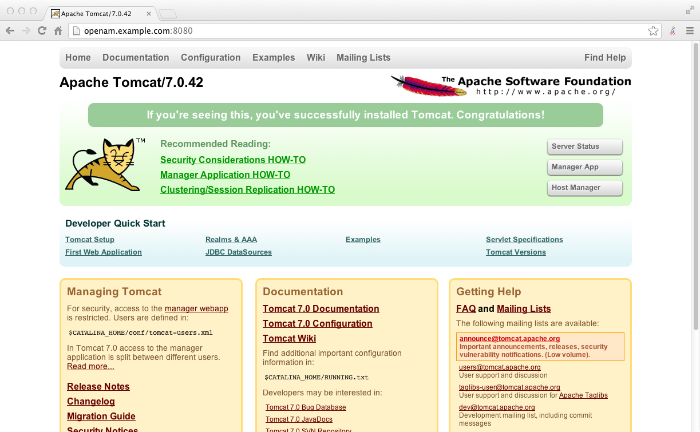 In the first chapter of the guide you installed a web policy agent to enforce OpenAM's authorization decisions on Apache HTTP Server. That web policy agent is only one of many policy agents that work with OpenAM. As described in the Administration Guide chapter, Chapter 5, "Configuring Policy Agent Profiles" in the Administration Guide, you find policy agents for different web servers, for a variety of Java EE web application containers, for protecting SOAP-based web services, and for OAuth 2.0 clients.